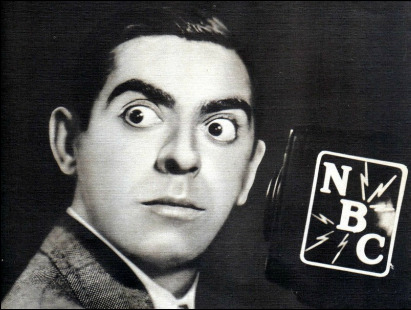 EDDIE CANTOR OPENED THE GOLDEN AGE WITH EYE POPPING RATINGS. ​In The Beginning... Broadcasting’s streets were truly paved with gold at the beginning of Network Radio’s Golden Age in 1932. Sixty percent of America’s homes were equipped with radios, all hungry for the free entertainment that the networks offered them - and offered to sponsors at an average $11,000 per prime time hour, ($195,600 in today’s money). In the three years since Variety’s legendary 1929 headline, Wall Street Lays An Egg, network revenues had grown a whopping 41% - to over $39 Million. Their combined total revenue in just four years had passed the $100 Million mark. NBC’s parent company, RCA, was a major player in a manufacturing industry that sold 2.5 million radios and 50 million radio tubes in 1932, generating over $72 Million in sales. RCA’s David Sarnoff could smile confidently while approving architects’ plans for NBC’s new eleven story showcase headquarters at Rockefeller Center. The complex and its neighboring theater would be called Radio City in recognition of its high profile occupant. Fred Allen, Al Jolson and the Marx Brothers made their network series debuts in the fall of 1932. They joined Eddie Cantor, Jack Benny, Ed Wynn, George Burns & Gracie Allen, Jack Pearl and Walter Winchell who had made earlier and briefer appearances before committing to full season series in 1932-33. Along with the stars, 1932-33 was the first season for nationwide broadcasts of the Carnation Contented Hour, Fred Waring’s Pennsylvanians, Vic & Sade and One Man’s Family which would all become network fixtures. The coffee company’s first NBC offering in 1929 was modest. The Chase & Sanborn Orchestra led by violinist David Rubinoff bounced around several Sunday night timeslots, most often following Major Bowes’ Capitol Theater Family variety show at 8:30. Sometimes known as The Chase & Sanborn Choral Orchestra, the subdued musical variety program drifted along until midway in the 1930-31 season. By that time, Rudy Vallee had made Fleischmann Yeast a household essential with his Thursday night variety hour. Standard Brands clearly wanted a recognizable star to sell its coffee just like Vallee was selling its yeast. Maurice Chevalier was signed for 26 weeks beginning on February 8, 1931, for a reported $5,000 per week, ($80,100 in today‘s money). This was an enormous sum in the depth of the Depression but illustrates how much Standard Brands’ believed in the selling power of popular entertainers on radio. The new Chase & Sanborn Hour starring Eddie Cantor with his orchestra leader and foil David Rubinoff debuted on September 13, 1931. It was an immediate hit - but for only five months. Cantor left the show in February, 1932, to film The Kid From Spain. Rubinoff and a string of guest hosts - George Jessel, singer Harry Richman and comedian Georgie Price - carried the Chase & Sanborn show the next eight months. Cantor returned on October 30,1932, and was greeted with a 49.4 Crossley rating. His average in February and March would hover at a stratospheric 60.0. He gave Standard Brands the first of its three top rated Sunday night series of the 1930's. And compared to Chevalier’s salary, Cantor’s $2,500 a week was a bargain. NBC’s Wynn Win Situation. Ed Wynn is recognized as the first big name comedian to appear on radio. He starred in a radio adaptation of his Broadway comedy, The Perfect Fool, from WJZ’s Newark studio on February 19, 1922. The early broadcast is also cited as the first major program to involve a studio audience. Ten years later Wynn was given a red helmet, $5,000 a week and became the Texaco Fire Chief. With a strong lead-in provided by Ben Bernie and his popular band, Wynn won Tuesday night and began a string of three finishes in the Annual Top Ten. Wynn’s buffoonery, with announcing legend Graham McNamee as his straight man, wore thin after those three seasons. He subsequently moved to CBS and Blue with different formats but his ratings never achieved the lofty 40's of his Fire Chief days. Pearl’s Peak. At 39, comedian Jack Pearl was on top of the world He was starring in the Gershwins’ Pardon My English on Broadway and his Baron Munchausen character with straight man Cliff Hall won Thursday night for NBC. Pearl generated the greatest ratings of his brief network career resulting in a third place finish among the season’s Top 50 programs. To make the season even sweeter, Pearl was voted the favorite radio comic in the New York World Telegram’s poll of 127 newspaper radio editors. Pearl’s variety hour for American Tobacco’s Lucky Strike Cigarettes enjoyed the lead-in of two Top Ten shows - Maxwell House Showboat and Rudy Valley’s Fleischmann Yeast Hour. The NBC lineup established a pattern for future Thursday nights in which hour-long variety shows would dominate the ratings. Showboating. General Foods joined Standard Brands as a major food advertiser on Thursday night in 1932 when it staked out the nine o’clock hour on NBC for its Maxwell House Showboat, titled for the coffee company it had acquired four years earlier. Showboat became the first in General Foods' collection of Thursday night hit shows on NBC that extended over the next 17 seasons. The program’s setting, a Mississippi River showboat, and its host, 48 year old character actor Charles Winninger, were both borrowed from 1929's Jerome Kern/Oscar Hammerstein II Broadway hit based the Edna Ferber novel. But the similarity ended there. Winninger’s Captain Henry presided over a large and rollicking radio production that offered music and romance provided by singers Lanny Ross, Muriel Wilson, a weekly parade of guest star “passengers” and comedy from resident blackface comics Pick Malone and Pat Padgett, known on the show as Molasses ‘n’ January. Showboat benefited from a strong lead-in provided by Rudy Vallee’s variety hour. Beginning in January, 1933, it scored a string of 27 consecutive months when its Crossley ratings never fell below 30, resulting in four straight seasons among the Annual Top Five shows. Ratings Rise In The Yeast. No Network Radio singing star was more popular during the 1930’s as Rudy Vallee. His record of six Top Ten seasons in the decade was matched only by Eddie Cantor and Jack Benny. When the Golden Age began Vallee already had three years of popularity to his credit as singing host of NBC’s Fleischmann Yeast Hour which began in 1929 when he was only 28. The saxophone playing crooner and his Connecticut Yankees band were joined by announcer Graham McNamee and top name guest stars every week. Marie Dressler, Phil Baker, Beatrice Lillie, Milton Berle, George Gershwin, Bert Lahr, Gertrude Niesen, Ken Murray, Ethel Merman, Sophie Tucker and George Jessel all appeared with Vallee during the first few weeks of the 1932-33 season. But Vallee - in concert with his producers at Fleischmann’s ad agency J. Walter Thompson - became better known for the discovery of new stars, including Alice Faye, Joe Penner, Frances Langford and the greatest find of all, ventriloquist Edgar Bergen. Although Bing Crosby, Frank Sinatra and other singers would eventually replace Vallee as Network Radio’s most popular vocalist, he adjusted to the changing times and developed excellent comedic talents. As a result, the 1932-33 season was just the first of 13 consecutive seasons in which Rudy Vallee finished in the Annual Top 50. Jolson Drives Chevrolet’s Ratings. Al Jolson made an immediate impact on the ratings when Chevrolet brought him to NBC’s Friday night schedule in late November. He was a show business legend at 46 - a Broadway star for over 20 years who had sold millions of records and already had five movies in sound to his credit - including Warner Brothers’ legendary The Jazz Singer. The Chevrolet show was, by design, a limited 15 week series that ran through February - providing a nationwide promotional vehicle for Jolson’s film, Hallelujah, I’m A Bum, which premiered in theaters on February 3rd. Jolson headlined three network series at the peak of his career in the 1930's and never fell below the Annual Top Ten. Their first year’s tenth place finish was owed in part to radio’s first major publicity stunt involving wholesale cross-promotion between programs and focused on Gracie’s scatterbrained persona. After several months of set-up gags describing her mythical and equally hare-brained brother - the one who hurt his leg falling off an ironing board while pressing his pants - she tearfully confided on the January 4. 1933, show that her beloved sibling had disappeared and appealed for the audience’s help to find him. J. Walter Thompson, General Cigar‘s agency, orchestrated Gracie’s “search” for her missing brother to other CBS programs and to shows it controlled on NBC and Blue, as well. Gracie would simply pop-up unannounced, do a short bit about her missing brother with the program’s star and leave. The wandering Gracie roamed from show to show and kept the running gag alive for months. Meanwhile, her real brother, a San Francisco accountant, went into hiding from the press. The stunt was a ratings bonanza. Burns & Allen’s January numbers jumped 32% over December’s 23.5 to a lofty 31.1. More telling were the ratings before and during the massive promotion. Burns and Allen scored a 19.3 average from September through December and a 31.3 from January through June - a 60% increase. It would be the couple’s first of five Top Ten seasons in the 1930’s. The soft drink maker moved the show to CBS in November, again twice per week but at different times. Benny’s Sunday night show aired at 10:00 and his Thursday show at 8:15. Benny’s ratings fell 20% in the confusing network, day and time switch. Canada Dry cancelled in January. The comedian was off the air in February, then debuted a new show for Chevrolet in March - this time just once a week - on NBC’s Friday schedule at 10:00. It was a prime timeslot, just vacated by Al Jolson. Benny’s ratings climbed steadily to a 22.2 in May, up 65% from his showing on CBS. It was just the beginning to his rise as Network Radio’s most popular comedian. Chicago’s Suppertime Shoot Out. A third of 1932-33's prime time network program-ming consisted of Multiple Run shows, broadcast at the same time over two to six nights a week. Multiple Runs broadcast across consecutive days of the week were identified as Strip Shows - generally low-budget, 15-minute studio productions without an audience. Led by Amos & Andy, Myrt & Marge and newscaster Lowell Thomas, six Strip Shows finished among the 1932-33 season’s Top 50 programs. It would be an all-time high. Freeman Gosden and Charles Correll were also near an all-time high with their Amos & Andy - which was the highest rated program on both Monday and Wednesday nights and and among the Top Ten programs every night it was broadcast. Over the course of an average week in the 1932-33 season, the nightly Amos & Andy on Blue racked up an incredible total of 142 rating points. Much of the serial’s audience were repeat listeners from night to night. Regardless, Gosden & Correll’s cumulative audience of over 26 million homes and 65+ million listeners per week was a record that no other program ever came close to matching. In response to this ratings giant, CBS pioneered the concept of counter-programming with a serial about two Broadway chorus girls, Myrt & Marge. It was strictly a Chicago battle for strip show supremacy. Both programs and their sponsors, Amos & Andy and its Pepsodent and Myrt & Marge and its Wrigley Gum were all based in the Windy City. Created by and starring the mother/daughter team of Myrtle Vail and Donna Damerel, Myrt & Marge siphoned enough listeners away from Amos & Andy to come within 5.4 rating points of the established comedy in the 1932-33 season. The melodrama finished in the Top Ten every night it was broadcast which resulted in twelfth place in the Annual Top 50. Myrt & Marge held down the 7:00 timeslot on CBS for five years before moving to the network’s daytime schedule. The series ended tragically when Damerel died in childbirth at age 29 in 1941. Her mother retired a year later. The Cowboy & The Columnist. One major star didn’t qualify for the year’s Top 50 programs, despite his ratings in the thirties. Homespun humorist Will Rogers’ appearances on Gulf Headliners was limited to the last eight weeks of the season. Nevertheless, Rogers boosted Blue’s half hour at 9:00 on Sunday from single digits to a May-June rating average of 34.1. It was the best lead-in that Walter Winchell would ever enjoy. A Classical Gas. Cities Service Concerts, headlined by soprano Jessica Dragonette, celebrated the best ratings of what would become the program’s 29 year series of classical, semi-classic, and brass band concerts on NBC. The show finished the season in 16th place with a 20.0 average rating. Although its ratings sank to single digits after four seasons and the program never again made a season’s Top 50 list, Cities Service Concerts - or Highways In Melody and Band of America as it was later known - joined The Voice of Firestone and The Telephone Hour as network radio’s three longest running prime time programs in which sponsors opted for musical prestige over mass popularity. Monday’s Music Mix. By the 1932-33 season The Voice of Firestone had become a four year classical music fixture on NBC’s Monday night schedule. It would stay there another 21 years. Its headline vocalists of the year: Gladys Swarthout, Richard Crooks and Lawrence Tibbett - all radio favorites. Voice would rank among Monday’s Top Ten programs ten times and register eight Top 50 seasons. Swarthout was also heard frequently on Carnation Milk’s Contented Hour which began its 17 year Monday night run on NBC in a decidedly more classical format than it would adopt in the mid-forties. The program’s name was a misnomer - the “hour” was never longer than 30 minutes. Harry Horlick’s eclectic A&P Gypsies might also occasionally toss in a classical number suitable to one of its weekly guest vocalists - including a very busy Gladys Swarthout. One of NBC’s inaugural network shows in November, 1926, The A&P Gypsies made history in 1932 for its sponsor, The Great Atlantic & Pacific Tea Company, when it became the first nighttime network program on which direct price and item advertising was broadcast. At the other end of the music spectrum, Blue tied for Monday's top rated honors with The Sinclair “Wiener” Minstrels. The traditional all-male minstrel show sponsored by Sinclair Oil was in the first of its five year run, finishing four times in Monday’s Top Ten. The program’s sausage-like identification was the nickname of the station from which it was broadcast, Chicago’s WENR. The Lady Weighs In. Six of Tuesday’s Top Ten were Multiple Run programs, indicative that Network Radio had yet to develop its prime time into blocks of hour and half hour weekly programs. Among the Multiple Runs was Kate Smith’s Tuesday through Thursday songfests for CBS boss Bill Paley’s LaPalina Cigars. While rival American Tobacco spent much larger sums in network radio advertising its Lucky Strike brand, Liggett & Myers promoted its Chesterfields with Music That Satsifies - a twist on the cigarette’s slogan, “They Satisfy” - a 15 minute show that floated around the CBS prime time schedule until finally becoming a Monday through Saturday strip at 9:00. The simple studio show rotated a list of singers that included the Boswell Sisters, Jane Froman, Arthur “The Street Singer” Tracy and Ruth Etting, all backed by Lenny Hayton’s CBS house band. Etting attracted the series’ largest audience until a newcomer was added to the mix in January, 1933..
Bing Crosby was 29 and already familiar to audiences through his series of Mack Sennett shorts and his first Paramount film, The Big Broadcast. When he was given Satisfies’ star billing on Wednesday and Saturday nights audience reaction was immediate for a show that seldom scored double digit ratings. Crosby’s ratings from January through March averaged a strong 18.5, nearly double Etting’s Monday and Thursday night shows. The series temporarily left the air in March, but Liggett & Myers didn’t forget its successful experiment in strip programming. Neither would Network Radio forget Bing Crosby who would become one of its biggest stars with a career of 20 Top 50 seasons, eight in the Annual Top Ten. Music was listeners' favorite format in 1932-33. Of the Top 51 programs, (two tied for 50th), 23 of them featured music formats. NBC claimed 24 of the leading shows, CBS originated 14 and Blue had 13.